Get a recipe, then adapt it! 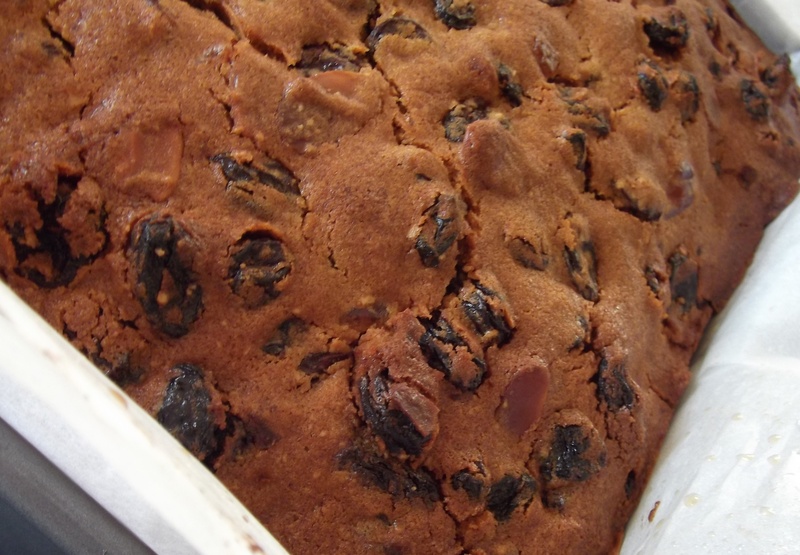 I know it is still 6 weeks until Christmas but this is the ideal time to make this Christmas Cake. Why? So you can feed it with plenty of booze before you put the icing on during Christmas week. I’ve been making this recipe for quite a few years and it has never failed to impress. I usually make it mid-October, but this year we have had family visiting from the UK so I have only just gotten round to it. 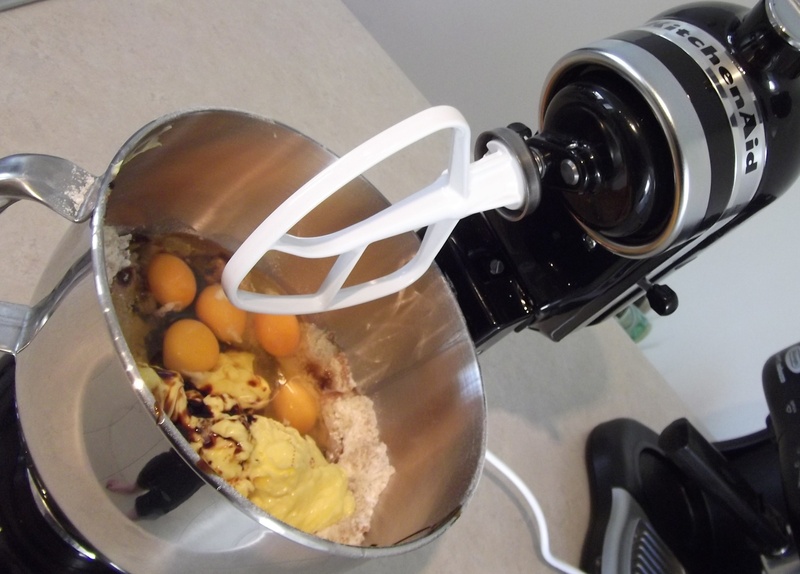 Plus, as you will see below, I have just invested in a KitchenAid Mixer so this was an ideal opportunity to test it out. The photos therefore don’t show the completely finished cake – it is literally just out of the oven so is still sitting in the pan! 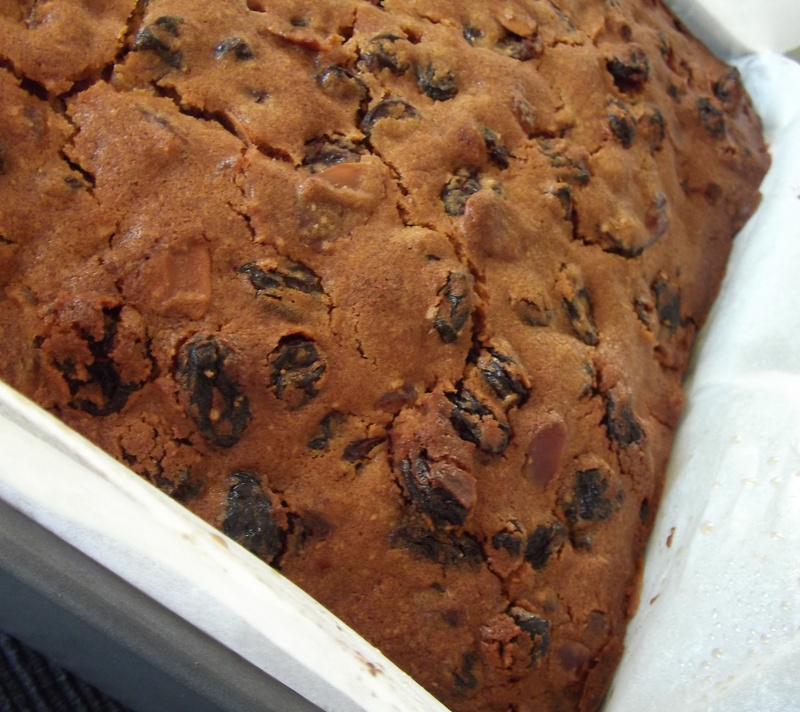 Normally I would use dark rum as the spirit for this cake, but this year I changed to Southern Comfort instead (because I didn’t realise that we had drunk all the rum). You could also use brandy if you want to be a bit more traditional. The ingredients listed below are for a 20cm/8 inch square or 23cm/9 inch round pan – the pan needs to be quite deep. I tend to make this cake in a square pan but there isn’t a particular reason why. 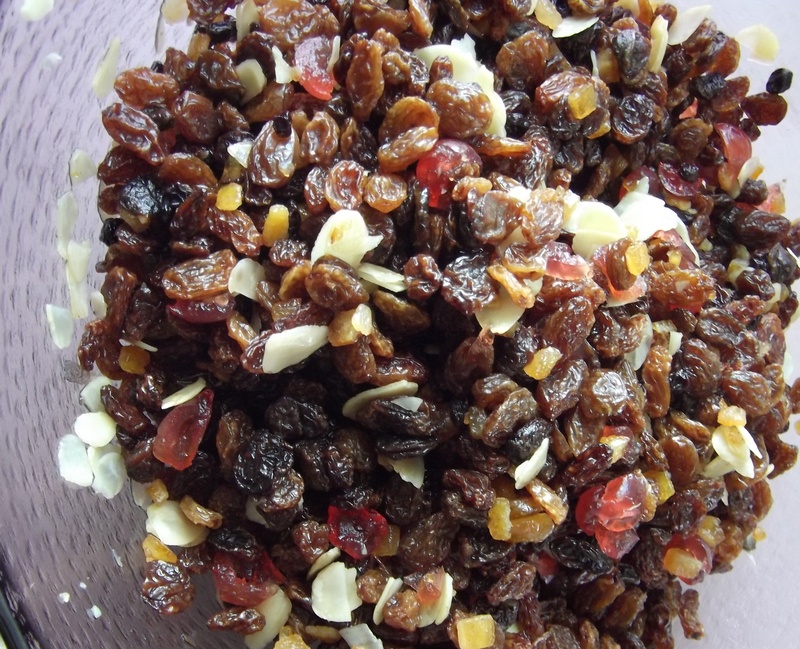 Put the fruit, cherries, flaked almonds, lemon juice and spirits into a large glass mixing bowl and stir together. Cover with cling wrap and leave overnight. Heat your oven to 140C/120C fan forced/275F. Grease your springform pan (see above for sizes) and double line with baking paper. Sift the flour and mixed spice into another large mixing bowl, then add the almond meal, sugar, butter, treacle and eggs. Mix together with a wooden spoon or your electric mixer until smooth and glossy. 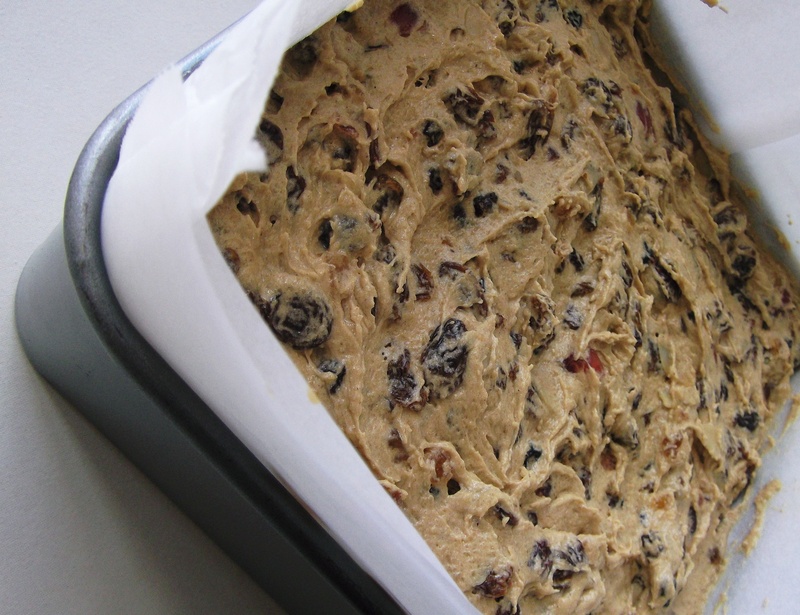 Gradually add in the fruit mixture, folding with a wooden spoon to combine. Bake for about 2 hours 45 minutes, testing the cake with a skewer in the last 30 minutes. The cake is cooked when the skewer comes out clean. Remove the cake from the oven and allow to cool in the pan. Take the cake out of the pan but do not remove the baking paper. Wrap in two layers of foil and store in a cool, dark place (a cupboard is fine). Every week between now and Christmas, drizzle 1/2 tbsp of your spirit over the top of the cake. Wait for the spirit to sink into the cake and then re-wrap. A couple of days before Christmas you can ice your cake. I generally use standard buttercream icing, (flavoured with either Baileys or Tia Maria if I feel like it), but you can go down the traditional route of marzipan and royal icing if you like. This entry was posted in Baking and tagged Alcohol, Baking, Cake, Celebration, Christmas, Desserts, Food, Recipe, Recipes. Bookmark the permalink. I totally agree, it needs to be fed with brandy! Now, or soon, is the perfect time to start. With the word booze and cake in the title of course had me very interested. A little booze for the cake a little brandy for the chef, it is all good. Have a great holiday. I usually soak my chopped fruits (excluding the nuts which are added when baking) for 6 months to a year… and it ends up packing quite a punch! Happy Holidays! Recipe Adaptors now has a Facebook page!